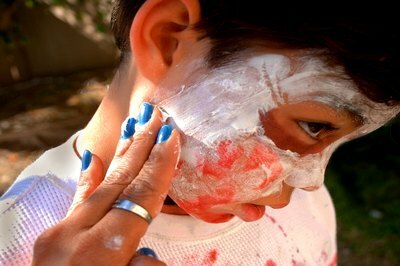 Zombies costumes are perfect for kids because they are simple and inexpensive to make, and kids will have a great time destroying old clothes and practicing their most ghoulish zombie walk. The basis for this costume is a shirt and pants that you don't mind destroying. If you don't have a pair of old pants and a shirt, visit a local thrift store for inexpensive options. 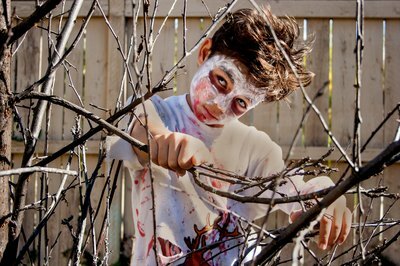 Because zombies are simply undead people from all walks of life, you can choose anything from a basic T-shirt and jeans to a uniform for a zombie Boy Scout or Brownie. 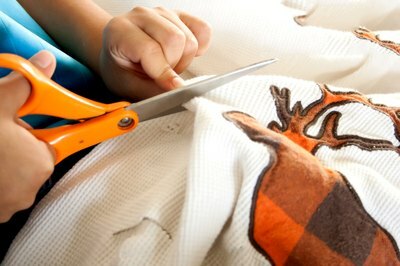 Cut holes and rips into the shirt and pants and cut the edges into tatters with scissors. Run a disposable razor along the edges of each cut to create a frayed look. 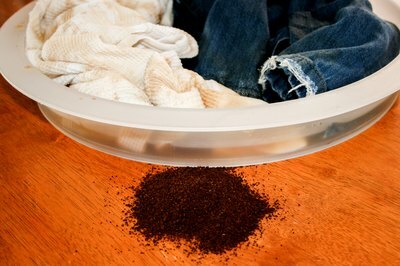 Soak your shirt and pants in a bowl of coffee or tea overnight to give clothes an old yellowed look. This works best on lighter colors. Hang clothes outside to dry. Rub clothes into the dirt and grass outside. Sprinkle fake blood over them while they're still on the ground and let them dry. Kids will have fun getting involved in this step, because destroying clothes is usually not allowed. Put on the shirt and pants. Cook a handful of rice or spaghetti that is cut it into small pieces. Let kids run their fingers through the slimy spaghetti or rice and sprinkle it over their clothing to look like maggots. Apply white face makeup all over and add purple makeup under the eyes. Apply fake blood underneath the lower lip. 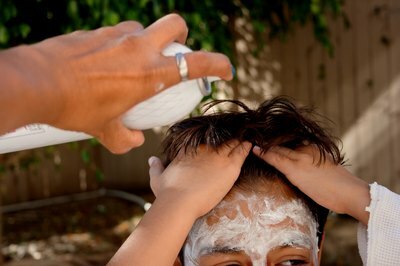 Add hairspray or gel to hair and let kids run their fingers through it to make it as messy as they want. Sprinkle flour throughout hair to create a recently buried dusty look.